This week it’s going to be all about simple, quick recipes because we’re still recovering from an amazing holiday on the east coast. It was a quick trip but we had a great time with family and friends. Being away from the farm kitchen was amazing for a few days and it felt great to take a break from being the head cook and let others do their thing. I got a lot of inspiration and cannot wait to try and re-create a few dishes. The recipe I’m most anxious to try at home is a creamy (vegan) celeriac soup that my mother-in-law, sister-in-law and I all enjoyed while dining out for lunch in Concord, MA. It was one of the best soups I’ve ever had and I hope I can create something half as good! Stay tuned. Now that we’re settling back into being home it’s nice standing in front of my own stove while Henry eats all the crumbs and I get to methodically stir a bowl of muffin batter. It’s amazing how much you can miss something so basic, yet somehow feel completely grounded when you’re back at it. Home sweet home! 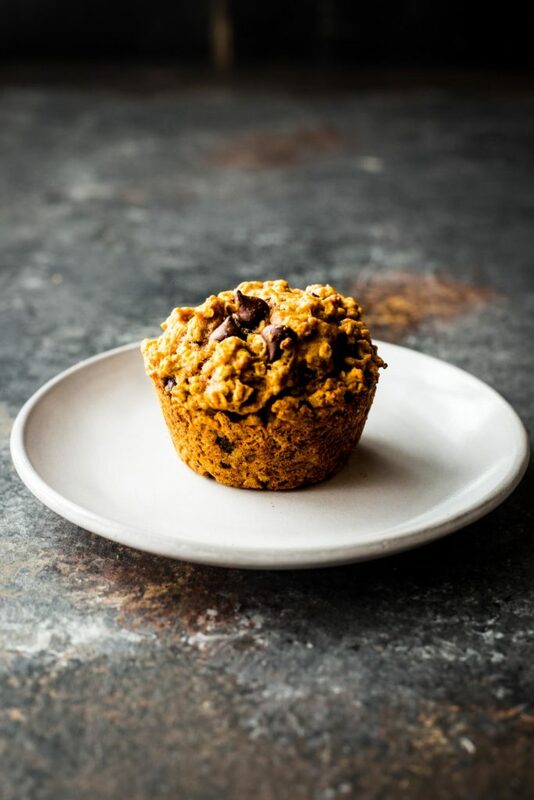 These butternut spice oat muffins are a lovely morning treat and are perfect when dunked into a cup of piping hot coffee. They’re sweet (but not too sweet) and the butternut squash puree lends a subtle nuttiness that I just adore. If you roast or steam your squash in advance these muffins are a breeze to prepare. Not only are these extremely moist, but they’re hearty and will help jumpstart any busy morning. I couldn’t resist adding some chocolate chips and had a heavy hand with the spices (both of which took these muffins to a whole new level!) I hope you all love these as much as we do. Pour a cup of coffee, whip out your wooden spoon and get baking! Preheat the oven to 375F. Grease a standard size muffin tin and set aside. In a large bowl whisk together the flour, oats, sugar, baking powder, spices and salt. In a separate bowl whisk together the egg, butternut squash, milk and oil. Pour the wet ingredients into the bowl with the dry ingredients until just combined. Fold in the chocolate chips. Divide the batter between the prepared muffin cups and bake in the oven until a toothpick comes out clean when inserted in the center of a muffin, about 15-20 minutes. Cool the muffins for 5 minutes in the pan before gently removing them and placing on a wire rack to cool completely. Store muffins at room temperature in a ziplock bag or sealed container for 3 days. Looks delicious! Have about that much butternut squash leftover. We will try it. What is the name of the restaurant where you enjoyed the yummy soup? Thats my neck of the woods! I go over there often and am always looking for new places for a nice bite to eat. Glad you had a nice visit! I just need any recipe that encourages my daughter (and me) to eat vegetables. Especially for breakfast. Do you think I could use butter as a substitute for oil? I’m currently out right now. Thanks for the recipe and I’m seriously looking forward to that celeriac soup recipe. I’m having a problem with one of your ingredients. “old fashioned rolled files” is it possible that spell checker got you? oats! thanks for the catch. Why do you use suggest the oils that you do? I’m already getting butternut squash in my CSA (it’s june!) and am looking for ways to use it!